Design studio Bravo! has exploited the textures and hues in rock from one of Chile's volcanos in this collection of 80 home accessories, featuring block colours, swirling patterns, mottled surfaces and thick veins. Bravo! 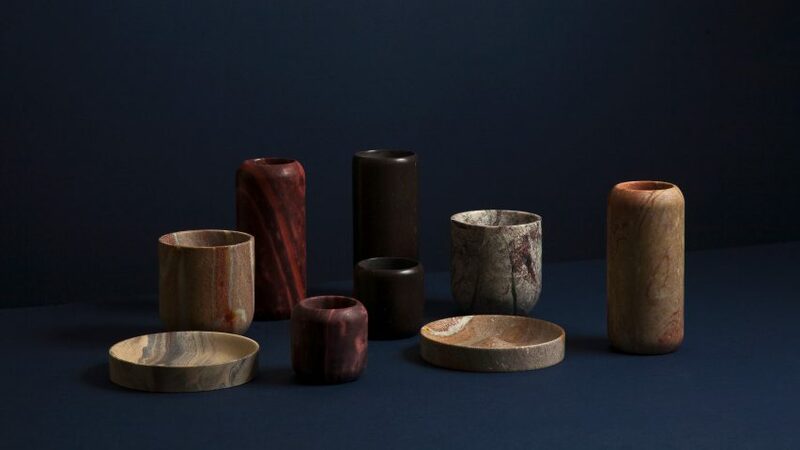 created the pieces from the semiprecious Combarbalita stone for the Monolith Series, and presented six of the designs at the Sight Unseen Offsite exhibition during the NYCxDesign festival last month. The Chilean volcanic rock is made up of minerals including kaolinite, natroalunite, silica and hematite, as well as small amounts of clay, quartz, copper and silver. The quantities of these components often vary so much that the appearance of the rock changes, offering the Santiago-based design studio plenty of of possibility for its collection. "Given the versatility in the natural composition of the stone, each piece designed varies in its veins, textures and colours, therefore, is completely unique and unrepeatable," said Bravo! in a statement. The studio – which completed the Monolith Series in two parts over one year – duplicated designs in the collection to further highlight the different finishes in the rock, from deep reds, greens and black, to paler tones in spiralling patterns, and mottled and veiny textures. 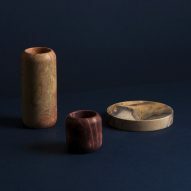 The shapes are hand-carved and suggest uses as vases and containers, although the studio intends this to be left open for interpretation. "Each object present in the series is conceived from technical and formal experimentation, as in sculpture, beyond pursuing a practical or functional operation, these objects assume a plastic and emotional commitment that allows its use to be freely interpreted," said Bravo! "In fact the series suggest a paradigm shift by changing and reducing the sculptural scale, commonly associated to architecture and public space, to a domestic and object level." 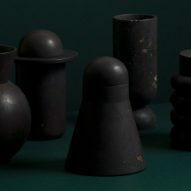 Series one comprises five designs including a cone-shaped and a cylindrical vessel, both of which have a rounded top, and a bulbous bottom with a cup-shaped lid that slots on top. 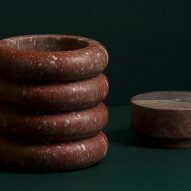 The fourth piece in the first edition is a ribbed design closed by a stopper, while the fifth object comprises two elements that look like a cup and a jug when taken apart. 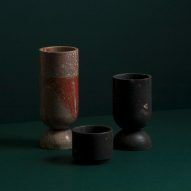 A pair of saucers and a series of cylindrical vases with curved lips features in the second part of the collection. The receptacles come in varying heights, and could be used for flowers or as drinking cups. Bravo! was founded in 2006 by Rodrigo Bravo, and draws on Chile's materials, production methods and technologies in its work. Sight Unseen Offsite took place 17-20 May 2018, at locations across Lower Manhattan. Other highlights from the showcase included a collection of furniture that designers created with musicians, actors and stylists, and a collection of playful items made by Scandi and US teams.